Founded by Uli Behringer in 1989, Behringer got its start in Willich Germany. Since then they have been dedicated to manufacturing top-quality equipment at budget-friendly prices. Their mission has been to provide professional grade products that everyone can afford. Behringer has won many awards throughout the years for their quality products. They sell their audio equipment in many countries all over the world. One of their products that is top-rated by consumers is their UCA202 audio interface. According to user reviews, it comes in at number one for the best audio interface. ​Audio interfaces are essential for both professional, as well as new musicians, to produce a high-quality recording. Let’s take a closer look at the Behringer UCA202 audio interface to help you to decide whether it is the one for you. When it comes to audio interfaces, sound quality is of course the number one concern for musicians. Just because an interface has many inputs and outputs does not mean it is the best quality. Of course, you need to make sure that you have enough inputs to do your recording, but remember that quality is better than quantity if you will be recording one track at a time. A great audio interface needs to have at least one good quality microphone pre-amp. An added bonus is if it has phantom power so that you can use it with different kinds of microphones. If you will be recording a band, you will need at least 8 inputs. However many inputs an interface has, they need to be good quality. Another thing that is important is portability, particularly if you will be moving it from place to place. A portable interface will be small and light so that you can just throw it in your bag when you need to take it with you. To be able to withstand life on the road, it should be housed in a durable, protective case. Any great interface should be easy-to-use. This is particularly important if you will be using an interface for the first time. USB interfaces are particularly easy to use and require no set-up. You just have to plug them in to get started. One big concern for artists when recording is latency. Latency is how long it takes for the sound to be played back to the musician through their headphones. If an interface causes excessive latency, it makes it very difficult for the artist to concentrate on their singing or playing. Any great interface needs to have little to zero latency. Everyone likes to save a buck or two when they can, so a great interface will provide top-quality performance at a budget-friendly price. 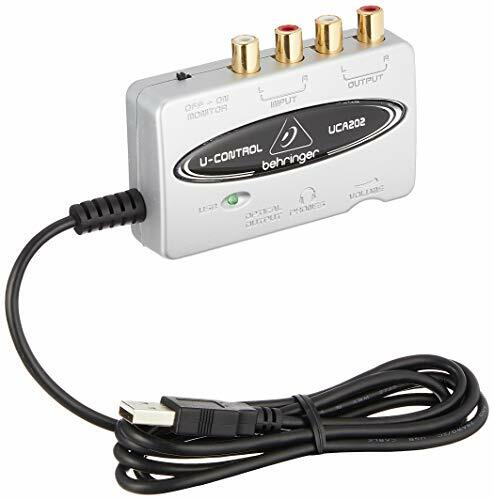 The Behringer UCA202 is one of the best USB audio interfaces currently on the market. The USB connection makes it easy to use and it requires no setup. All you have to do is plug it into your Windows or Mac computer to get started. The UCA202 has two analog mono inputs and outputs as well as an additional S/PDIF optical output for direct analog to digital conversion. The stereo headphone output has a dedicated level control so you can monitor both input and output. Featuring high-resolution 48 kHz converters, you are guaranteed high-end audio quality. It has low latency so that you can get record without distraction. Its rugged construction and small size make it easily portable. One thing customers love about the UCA202 is that it is very affordable and easy to use. All you have to do is plug it in and you can start working. It is compact and portable, making it easy to take along with you. The headphone input provides minimal latency, which makes recording easier. Users report that it produces excellent sound quality. The UCA202 is a simple interface but it does everything it says it will do. There aren’t many complaints about this product. The only downside that users report is that it doesn’t come with detailed instructions so if you aren’t familiar with using an interface, you may have to do some research online. The Behringer UCA202 is a good quality audio interface. It is ideal if you just want something simple and affordable.